I hope everyone here in Canada had a relaxing Thanksgiving weekend. 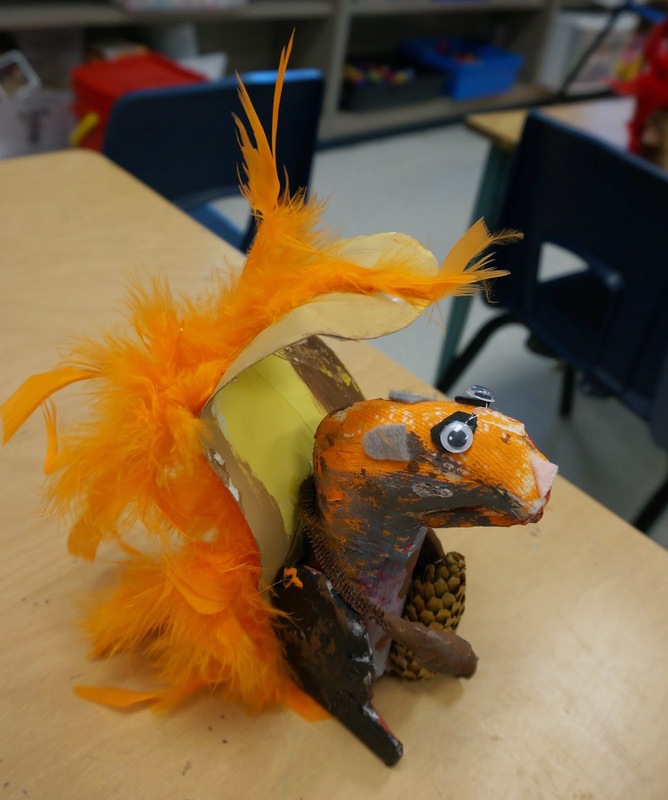 I made these squirrels 2 weeks ago with a Grade 1 class. Take your paper roll and stuff with a newspaper page. Squash another page of newspaper into an oval shape. Tape this to one end of the paper tube with masking tape. I have it angling out to look like a head. Put a few pieces of masking tape over other end of paper tube to keep newspaper inside. Cut 2 legs out of cardboard. They are about half as tall as the cardboard tube. The foot comes out and they are straight on the bottom. Take your pipe cleaner and make 2 loops at both ends twisting the pipe cleaner onto itself. It ends up being approximately 7" or 15cm. For Grade 1, I did this prep ahead of time for them. Older grades (grade 3 and up) could do this for themselves. Set up your workspace for papier mache. We worked on top of a piece of wax paper. Get your glue and water mixture going and hand out some paper towel strips to everyone. I learned this great tip from the art of education, I made up a newspaper strip for each child with their name on it. When they were finished their papier mache they stuck on the strip. Great for keeping track of every one's work. Dip your strips in the glue mixture and start covering your paper roll armature. I asked the kids to cross the strips. We added a belly to the front. Put on that name strip. Add a little papier mache to the front of the leg and papier mache those hand loops on the pipe cleaner as well. Set aside to dry for 2 days. Most of our paper tube armatures would stand up for drying. Turn leg and arms over halfway thru the drying time so everything dries out completely. When the pieces are all dry paint with acrylic or tempera paint in Fall colours. I made some wired paper for the base of the tail. You take one strip of paper, run a line of glue down the length, lay your piece of wire into this glue. Take your glue and do some zig zags all over the paper. Place another paper strip on top sandwiching the wire between them. I also used my fingers and ran down the sides of the wire to make sure it was secure in that sandwich. We cut them into a large feather shape. Paint the feather shape in Fall colours on both sides. I bought some feather boas at the Dollar store. Cut into pieces about as long as the feather shape. Glue to one side. Now it's time to glue together. We used a glue gun to put on the legs and arm strip. This enabled us to angle the legs if needed in order to get the squirrel to stand. Glue tail onto the back of the squirrel. With scraps of felt add a nose and ears. We glued on googly eyes as well. The Grade ones went on a nature hike and collected some pine cones. We added these as well. These are so stinkin' ADORABLE! Pinning!